New Study: Fossil Fuel Funding of Climate Science Denial Goes "Dark"
As we well know, the fossil fuel industries have spent large sums of money over the years to attack clean energy, to get positive press coverage, and to defend their gravy train of taxpayer-funded corporate welfare. Not surprisingly, there's been serious pushback to these efforts, which in turn appears to be pushing fossil fuel interests to more carefully cover their tracks. A new study, outlined in this article, explains how. I hate to criticize the federal agency I worked at for 17+ years, especially since the Energy Information Administration (EIA) does great work in many areas (e.g., data collection, energy market and oil supply disruption analysis). But when it comes to long-term energy forecasting (whether we're talking prices, production, consumption, imports, whatever), I'm sorry to say, EIA has been not just wrong, time and time again, but laughably, outrageously wrong. And, sadly, their latest Annual Energy Outlook (the AEO - with "forecasts," using the word VERY loosely, out to 2040) continues that abysmal tradition. More on the AEO shortly. But first, let's review EIA's track record on long-term forecasting, from a recent article by Old Dominion University Professor Steve Yetiv and me in the Journal of Energy Security. *Looking at EIA's 2005 AEO (note: this is somewhat random, but you'd find the same problems in pretty much ANY year's AEO), EIA forecast 2013 oil prices would be around $25-$30 per barrel, with gasoline prices of around $1.50/gallon. The actual prices? More like $100 per barrel for oil and $3.50/gallon for gasoline in the US market. That's off by a factor of 3-4 fold. Yikes! *Back in 2005, EIA forecast US crude oil production would reach about 5.7 million barrels per day (bbl/d) in 2013, with Lower-US-48 production declining steadily after 2009. Actual US production so far in 2013? How about 7.3 million barrels per day (bbl/d) and rising fast? That's wildly off, both directionally and in absolute terms (by 1.6 million bbl/d). *Likewise, the 2005 EIA forecast for US natural gas production in 2013 was wildly off -- about 20.6 trillion cubic feet (Tcf), compared to actual production of 24.2 Tcf. Not even close. *EIA was also wildly off on U.S. gross oil imports, forecasting that they would rise sharply, from 12.3 million bbl/d in 2003 to 20.2 million bbl/d in 2025. What's actually happened so far is that US gross oil imports have fallen sharply, from 12.3 million bpd in 2003 to just 9.7 million bpd in 2013. US net oil imports have fallen even more sharply, from 11.2 million bpd in 2003 to 6.7 million bpd in 2013. EIA predicted the exact opposite. *EIA's 2005 long-term forecast also missed the future price of natural gas in the US by a huge margin: a forecast price for 2012 of $3.80/thousand cubic feet (mcf) compared to the actual price of $10.66/mcf. That's not even close; heck, it's not even close to being close! *In 2005, EIA forecast that U.S. solar power capacity would hit about 1.2 GW in 2013. Where are we right now? According to Greentech Media, the U.S. is closing in (if it already hasn't passed) the 10 GW mark in solar PV capacity right about now, and that's not even counting solar thermal power generating capacity (according to this article, you can add another 1 GW or so of U.S. solar thermal power capacity). In sum, EIA forecast 1.2 GW of U.S. solar power capacity in 2013; the actual figure is around 11 GW - nearly 10 times higher than EIA forecast! 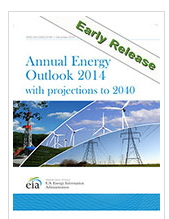 *In 2005, EIA forecast that U.S. wind power capacity would reach about 9 gigawatts (GW) in 2013. Where, in fact, are we right now? According to theAmerican Wind Energy Association (AWEA), installed U.S. wind power capacity at the end of 2012 was 60 GW. Quick math: EIA's forecast of 9 GW compared to an actual 60 GW? That's off by a factor of nearly 7! We could go on and on with this, but you get the picture: EIA has basically ZERO ability to forecast long-term energy trends even close to correctly.Let me emphasize: it's not that EIA is off by a just a bit; they're off by orders of magnitude. In that context, let's look at their latest long-term "forecasts" for renewable energy. So, let us see if I get this straight. The oil and gas industries claim they are too frail to give up their welfare check, they tell Sen. Max Baucus. Stories like this one are why water-conserving, clean energy technologies need to - and hopefully will - dominate the future. We're all well aware of the adverse health and environmental consequences stemming from fossil fuel extraction, transportation and consumption. On Monday, for instance, we highlighted a report by Raw Story entitled, "The 10 most toxic ingredients used by fossil fuel industries." To put it mildly, it's not a pretty picture. Raw Story: "The 10 most toxic ingredients used by fossil fuel industries"
We know that burning fossil fuels emits a wide variety of nasty pollutants - particulates (which increase the the risk of respiratory illnesses), sulfur dioxide (which causes acid rain), mercury (which contaminates fish), lead (which can lead to learning disabilities), carbon monoxide (which can cause shortness of breath, headaches and dizziness), carbon dioxide (which contributes to global warming), and many others. We also know that the process of extracting and transporting fossil fuels causes significant environmental damage, including enormous oil spills like the Deepwater Horizon disaster. Here are five recommended reads for today (12/2/13).